Know the signs. Stair-step cracks are among the most common signs of potentially serious damage to foundation walls. Ayers Basement Systems specializes in providing quality foundation wall repair. Our trained professionals can diagnose the cause of all types of foundation wall problems and provide you with a long lasting solution that will stabilize your home. If you have issues with bowing, buckling or cracked foundation walls in your home, call us today at 1-844-262-2971 or contact us online to learn more about how we can help you. We offer free estimates in Lansing, Grand Rapids, Kalamazoo and throughout the surrounding areas. If you have windows or doors that are difficult to open and close, misaligned locks, or cracks at the top corners of the openings, the problem may actually be with your foundation! While cracks above the window or door are an obvious warning sign, sticking windows and doors often indicate foundation settlement as well. Windows and doors are considered structural weak points and therefore are more susceptible to damage. When sections of your foundation sink into the soils around your home, the walls shift and change your house's alignment. This creates skewed openings that cause inflexible drywall to crack and leads to windows and doors getting stuck. Similar problems can result from sinking crawl space joists that cause your walls and floors to be unlevel. No matter which problem you have, the solutions are very similar. For settling foundations, we install foundation piers to provide additional support to the walls and raise them to their original position. This will prevent further deterioration and ensure that your doors and windows function correctly. If the problem lies in the crawl space, we use crawl space support jacks to secure the joists and maintain the stability of your home. If you're having problems with damaged foundation walls in your home, call the experts at Ayers Basement Systems today. We offer complete foundation repair services to ensure that your home is safe, stable, and maintains its value. If you have a foundation problem in your home, call us today at 1-844-262-2971 or contact us online to get started with a free estimate! 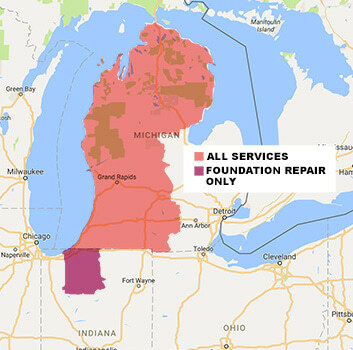 We proudly provide foundation wall repair in Kalamazoo, Lansing, Grand Rapids, Traverse City, Battle Creek, Muskegon, Jackson, Mount Pleasant, Traverse City, Niles, Alpena and throughout the surrounding areas.